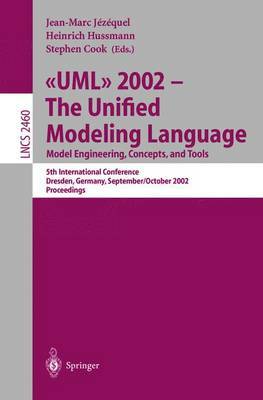 Five years on from its adoption in 1997 by the Object Management Group (OMG), the Uni?ed Modeling Language is the de facto standard for creating - agrammatic models of software systems. More than 100 books have been written about UML, and it is taught to students throughout the world. The de?nition of UML version 2 is well under way, and should be largely completed within the year. This will not only improve and enhance UML itself, including standard facilities for diagram interchange, but also make it fully integrated with other modeling technologies from the OMG, such as Meta-Object Facility (MOF) and XML Metadata Interchange (XMI). The Object Constraint Language, which has become an important vehicle for communicating detailed insights between UML researchers and practitioners, will have a much expanded speci?cation and be better integrated with the UML. The popularity of UML signi?es the possibility of a shift of immense prop- tions in the practice of software development, at least comparable to the shift from the use of assembly language to "third-generation" or "high-level" p- gramming languages. We dream of describing the behavior of software systems in terms of models, closely related to the needs of the enterprise being served, and being able to routinely translate these models automatically into executing p- grams on distributed computing systems. The OMG is promoting Model-Driven Architecture (MDA) as a signi?cant step towards this vision, and the MDA c- cept has received considerable support within the IT industry.